Corn on the cob is a staple in our house all summer long and I’m so excited that it’s coming into season again! 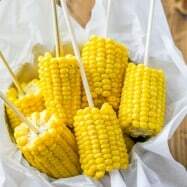 I love those plump, tender kernels that spontaneously squirt when you bite into them. Y’all know what I’m talkin’ ’bout?! 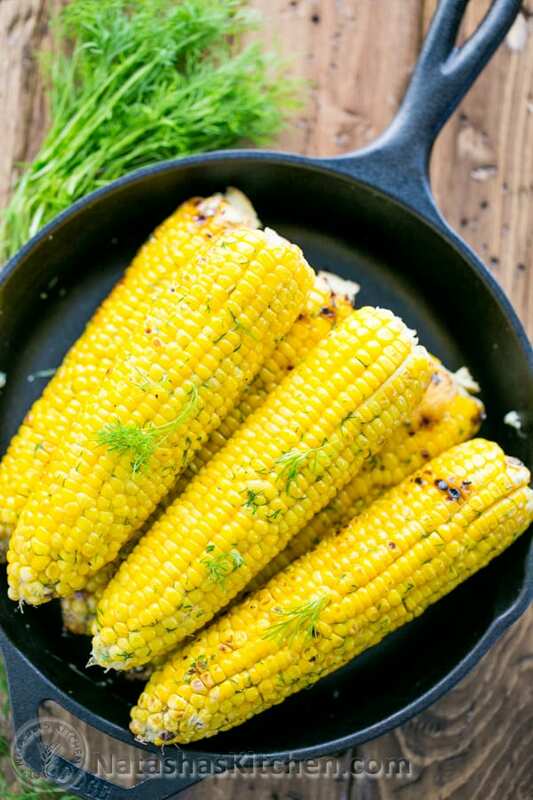 This is an easy way to grill corn on the cob. The prep is minimal and they turn out moist and flavorful. My cousin’s wife, Alla, grilled corn this way on our recent trip to WA. I love the idea of placing them on a grill when it’s hot out and you’d rather not be stuck indoors firing up your stove. You can even serve the corn plain without butter (if you’re counting calories) and enjoy your juicy cob right out of the foil. 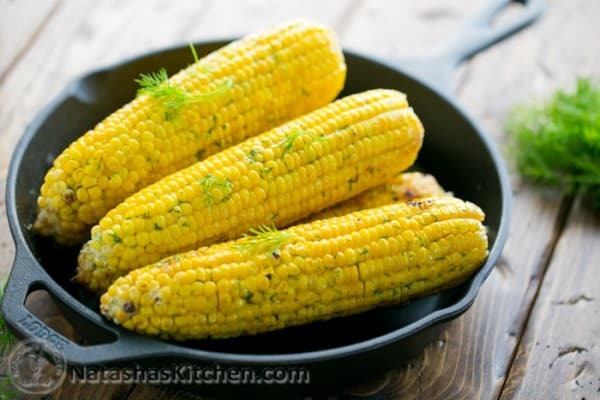 The lemon dill butter is quite a treat though and makes this corn irresistible. I brought it over to my sister’s house and everyone loved it! Keep this method in mind when you go camping. Although if you’re putting the cob into a camp fire, I’d recommend double wrapping with foil. Now you’ve got me thinking about camping! 1. Cream 4 Tbsp butter with a fork in a medium bowl. 2. 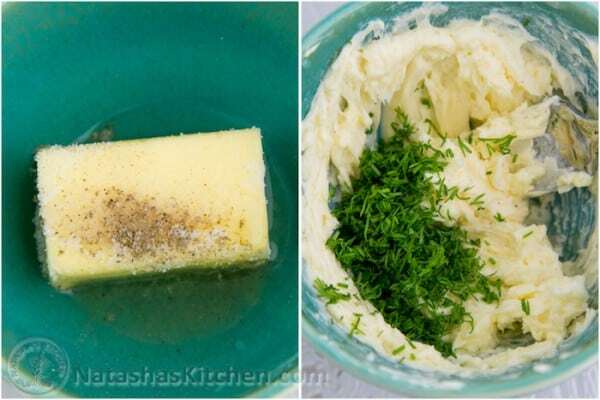 Stir in 1/4 tsp salt, pinch of pepper and 1 Tbsp fresh lemon juice and mix until smooth. The lemon juice will seem like it isn’t blending, but keep mixing for a couple minutes and it will happen ;). 3. Stir in fresh chopped dill until well incorporated. Keep the prepared butter at room temp until ready to serve corn. 1. Shuck corn. 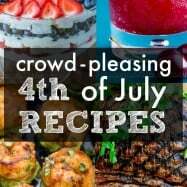 Leave the corn whole or break corn into halves or thirds if serving a large crowd. 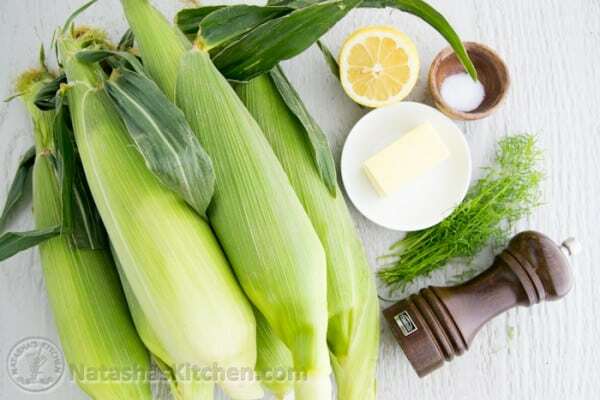 Wrap each ear of corn with a generous sheet of foil making sure all sides are covered. If using regular kitchen-standard foil, make sure to use ample foil so your corn doesn’t get scorched. 2. Grill foil-wrapped corn with the lid closed over medium/high heat, rotating the corn every 2 -3 minutes to keep from scorching. Grill for 15-20 minutes. Ours was done at 18 minutes. 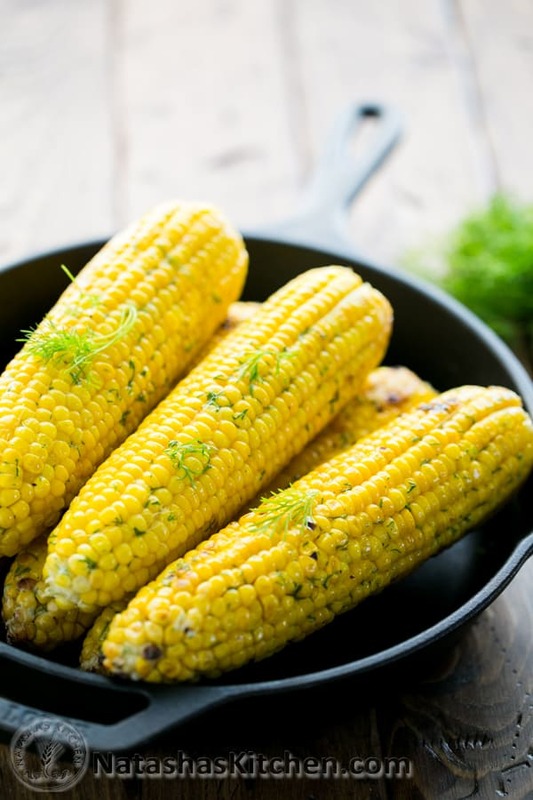 Once corn is finished grilling, remove foil and brush generously with lemon dill butter while warm. Serve immediately (you won’t want to wait!). Notes: I don’t add any butter or oil to the cob inside the foil. I have found that it’s unnecessary; the corn is naturally juicy and the foil seals in the moisture. You also don’t have to worry about oil leaking out of the corn and causing fiery flare-ups on the grill. This is an easy way to grill corn on the cob. The prep is minimal and they turn out moist and flavorful. You can even serve the corn plain without butter (if you're counting calories) and enjoy your juicy cob right out of the foil. 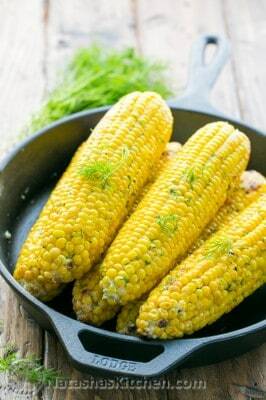 The lemon dill butter is quite a treat though and makes this corn irresistible. Keep this method in mind when you go camping. Although if you're putting the cob into a camp fire, I'd recommend double wrapping with foil. Cream 4 Tbsp butter with a fork in a medium bowl. Stir in 1/4 tsp salt, pinch of pepper and 1 Tbsp fresh lemon juice and mix until smooth. 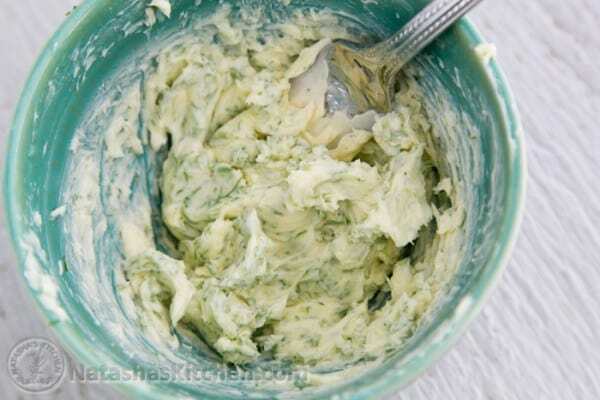 The lemon juice will seem like it isn't blending, but keep mixing for a couple minutes and it will happen. Stir in fresh chopped dill until well incorporated. Keep the prepared butter at room temp until ready to serve corn. 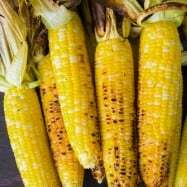 How to Grill Corn: Preheat Grill to Med/High. Shuck corn. 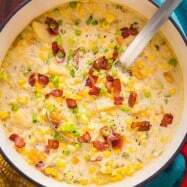 Leave the corn whole or break corn into halves or thirds if serving a large crowd. 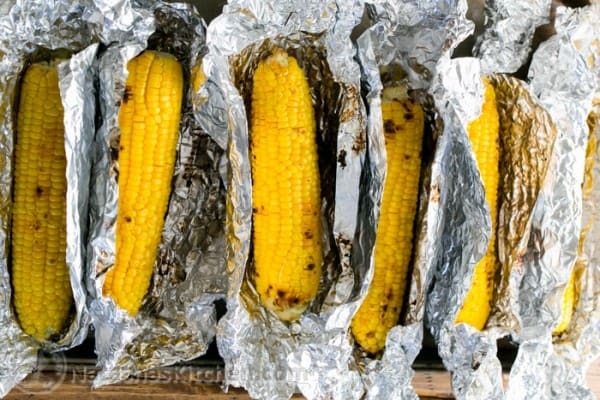 Wrap each ear of corn with a generous sheet of foil making sure all sides are covered. 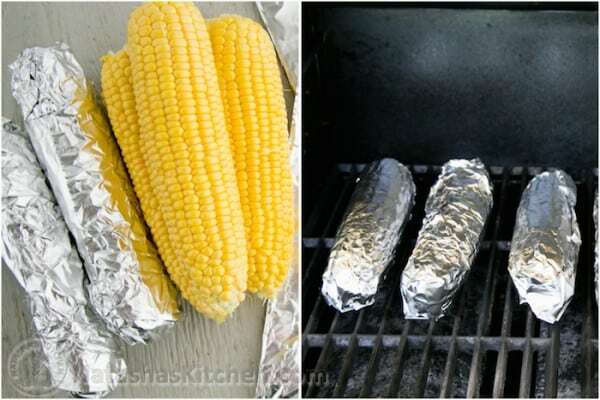 If using regular kitchen-standard foil, make sure to use ample foil so your corn doesn't get scorched. Grill foil-wrapped corn with the lid closed over medium/high heat, rotating the corn every 2 -3 minutes to keep from scorching. Grill for 15-20 minutes. Ours was done at 18 minutes. Once corn is finished grilling, remove foil and brush generously with lemon dill butter while warm. Serve immediately (you won't want to wait!). I don't add any butter or oil to the cob inside the foil. I have found that it's unnecessary; the corn is naturally juicy and the foil seals in the moisture. You also don't have to worry about oil leaking out of the corn and causing fiery flare-ups on the grill. Are you as happy about corn season as I am?! 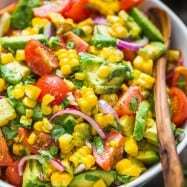 What’s your all-time favorite way to prepare corn? 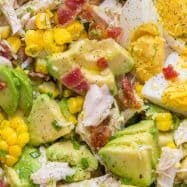 Hi Natasha, this recipe makes my mouth watering…however, I was thinking if it could be done in the oven instead and at which temp to do it….